I just got home from my last day as a Disney cast member in Captain Cook's in the Polynesian Resort. It was originally supposed to be a 5:00 pm to 1:30 am shift, but one of my managers felt bad because I had been doing that shift for basically my entire last week as a CP, so she told me last night at work that she changed my schedule to 4:30 to 10:30 pm! I was ecstatic. Lately I've been kind of excited to be heading home, mainly because I feel like I need a vacation from work and I really miss my hometown best friends. There's really only so many times you can explain the Disney Dining Plan to guests before you start to really need a break lol. So last night before I watched Fantasmic! 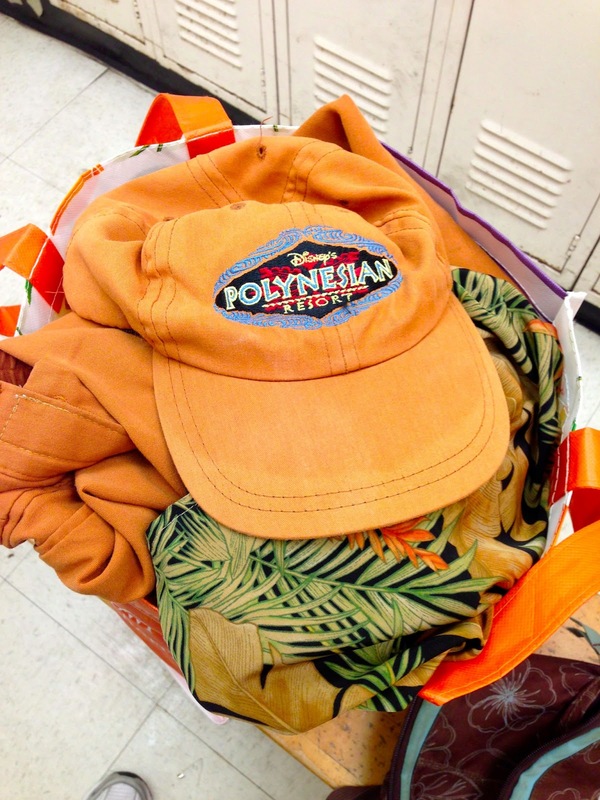 one more time, my friend Jake said, "It's your last time in the Poly costume tomorrow!" I threw my hands up in the air excited, and he looked shocked. I was mainly referring to not needing to wear that hideous costume anymore, but at that moment I didn't feel too sad when I thought about no longer working. However, when I went home after the show, I started feeling extremely depressed because of what that meant. No longer working at the Poly meant I was no longer a Disney cast member, and that this program is actually ending and there's nothing I can do about it. Yesterday I said goodbye to Jake and one of my closest co-workers who actually works part time at my location. I got a little teary eyed at work when I said goodbye to him, but never did I think it would hit me as hard as it did after I finished work today. I was breaker, one of my favorite positions because that means I got to do cashier AND counter, but only for short bits of time while moving from position to position. (Basically, breaker lets other cast members go on their break, while you work in their place until they come back.) I was in charge of breaks from 6 to 8:45, then my break was from 8:45 to 9:00. When I came back from my break I helped out the person on the counter and decided to walk to the beach to pick up trays by the pool. The best part about that is I got to watch a little bit of the movie that was playing on the beach (Monsters Inc. was on tonight). When I came back I dumped some food that needed to be spoiled, and then my manager walked up to me and said, "How happy would you be if I gave you an ER on your last day?" (ER=early release). I told her that she would be my most favorite person ever, and then she gave me a giant hug, telling me how much it's been a pleasure working with me. I started to immediately feel sad, and then I went to quickly give a giant hug to one of the culinary cast members that I considered to be kind of a mother to me. When I said goodbye to her, I lost it. I had to sneak out the back and around the patio to the cast member bathroom with my hat covering my eyes so guests couldn't see my eyes starting to water. I locked myself in a bathroom stall and just let it out. It finally hit me that that was the last time I was going to be working at Captain Cook's, and I only had one more full day at Disney before my flight home. I wasn't going to be able to see my friends and co-workers every day like I was used to, and that was going to be the hardest part. After I composed myself some more I walked out of the bathroom to clock out one final time and clean out my locker. I got my costumes in a bag and walked out of the loading dock one last time. As I was walking, the fireworks from Wishes were going off. This made me smile, and as I turned around to watch them as I walked to costuming, the Iron Man monorail drove by. It was seriously like out of a movie it couldn't have possibly been more perfect. (The Iron Man monorail is my absolute fave, by the way.) I stood in the parking lot for a little bit and watched the fireworks until it was time to finally turn in my costume. No more orange pants and tacky floral for me! The last few nights I've mainly been packing and trying to organize my life into two suitcases and one backpack, which is getting pretty challenging since I have more things now than I did when I came down here. Tomorrow is our last day to go to the parks, so we're going to try and tackle all four in one day after making a quick stop at the UPS to send some things home. I can't believe it's all about to end. This has been the experience of a lifetime and I wouldn't trade it for the world. I've met so many incredible people and learned so many new things. I'm eternally grateful for this experience. I'll be posting videos and blog posts once I get home. I have video blogs from parks set up as well as written blogs planned about my overall experience, the class I took, etc. If you have any requests, just let me know! Just like my boss says, see ya real soon!